All hail King Kale! Celebrate this nutrient-packed superfood with these royally delicious recipes. Not crazy for kale, switch to spinach try this Spinach & Ricotta Pasta and this easy Spinach & Parmesan Risotto. 1) Preheat oven to 300ºF. Line two baking sheets with parchment paper. 2) Remove any large stems by stripping the leaves from the stalk using your hands. Tear your kale into rough, 3-inch pieces.Wash and carefully dry kale leaves thoroughly because wet leaves will steam in the oven versus bake and crisp. 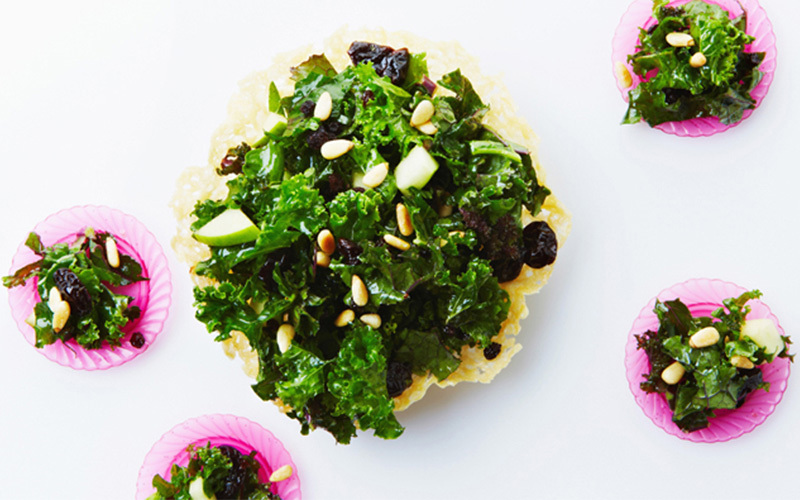 Place kale on baking sheets in single layer. 3) Drizzle leaves with olive oil. Using you hands, gently toss the kale and lightly rub the oil into each piece. If you need a little more oil, add it now. Redistribute the kale back to a single layer. Sprinkle on salt and any additional flavorings. 4) Place trays in the oven. 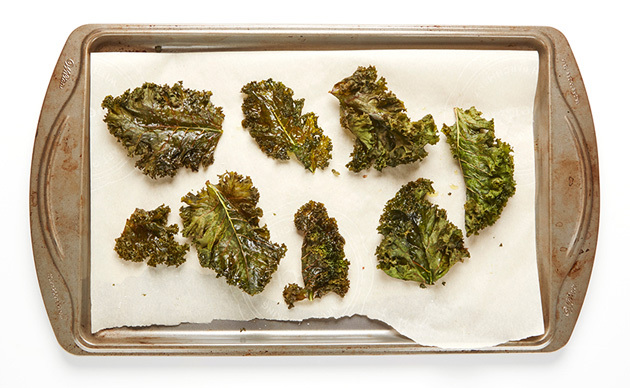 Bake for 5 minutes, then rotate trays as the thin pieces of kale will quickly brown in your oven’s hot spots. Check again after 3 minutes. You will hear the kale sizzling from the oil. Carefully pick up or nudge a chip. You want them to be crisp but not browned. Remove from oven and let cool on the tray. 1) For the dough, in a large bowl, combine flour, yeast and salt. Add oil and water and knead lightly to combine ingredients. Turn dough out onto a lightly floured surface and knead by hand for 3-5 minutes, until the dough is smooth and no longer sticky. Place dough in a large bowl that has been coated with non-stick cooking spray. Cover with a towel and let rise for 30 minutes. 2) Preheat oven to 450ºF and preheat a pizza stone for at least 30 minutes before baking pizzas. 3) To prepare the kale, heat olive oil in a medium skillet over medium high heat. Add the kale and cook, stirring occasionally just until the leaves are slightly wilted. Remove from heat and set aside. 4) To assemble pizzas, divide the dough in half and roll each half into a 10-inch round on a lightly floured surface. Spread the tomato sauce on both pizzas. 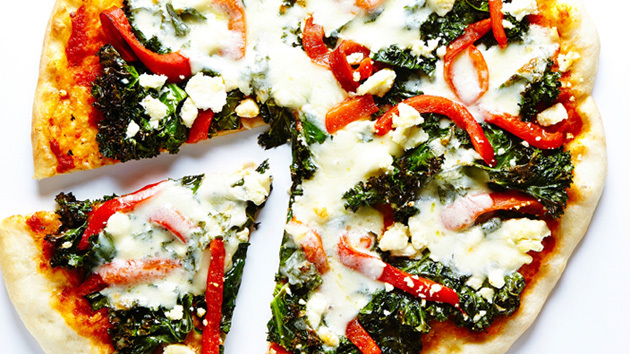 Evenly place kale and roasted red peppers over the tomato sauce, sprinkle with feta cheese and place mozzarella slices evenly around both pizzas. Drizzle a few drops of olive oil over the pizzas and sprinkle with salt. Transfer pizza to the preheated stone and bake until cheese is melted and the crust is golden brown, about 12-15 minutes. 1) Preheat oven to 400°F. Rub the outside of each potato with olive oil and pierce each with a fork several times. Bake 50-60 minutes, until fork tender. 2) While potatoes are baking, in a medium sauce pan, bring ½ cup water to a boil over high heat. Reduce heat to low, add kale, cover and cook 2-3 minutes, until kale turns bright green. Drain, dry well and set aside. 3) Remove potatoes from oven and let cool until you can handle them. Cut potatoes in half lengthwise and scoop out flesh leaving ¼ inch potato flesh on bottom and sides of the potato skin. Place potato flesh in a large mixing bowl and mash with butter, buttermilk and sour cream until desired consistency. Gently fold in cooked kale, Fontina, green onions, salt and pepper. Discard 2 potato halves so you have more stuffing for the remaining 6 skins. 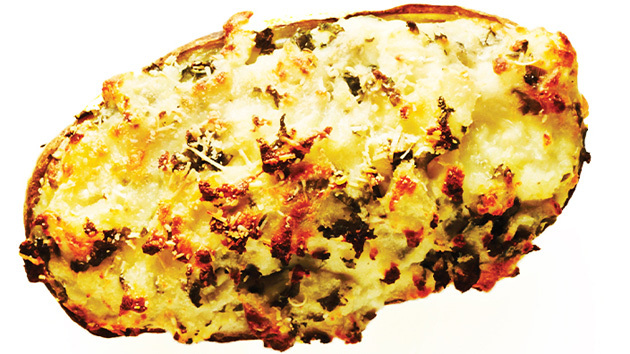 Mound the mixture in potato shells, sprinkle each with 1 tbsp Parmesan and place on a baking sheet. Bake at 400°F for 15-20 minutes until golden on top. 1) To cook quinoa, in a medium saucepan, combine quinoa, water and salt. Bring to a boil over high heat. Reduce heat to a simmer, cover and cook 15 minutes. Remove from heat and let sit covered for 5 minutes. Place in a large bowl and let cool. 2) For the spiced walnuts, in a medium skillet, melt butter over medium heat. Add walnuts, cumin, salt, cinnamon and cayenne pepper. Stir continuously for 3 minutes, until walnuts are slightly toasted. Add brown sugar and water and continue cooking, stirring constantly for 1 minute. Remove from heat, spread on a piece of parchment paper and let cool. 3) For the salad dressing, in a small mixing bowl, whisk lemon juice, sherry vinegar, honey, shallots, Dijon mustard, salt and pepper. Slowly add the olive oil, whisking vigorously until emulsified. 4) To assemble the salad, place kale and spinach leaves in a large serving bowl. Toss with a few tablespoons of dressing. 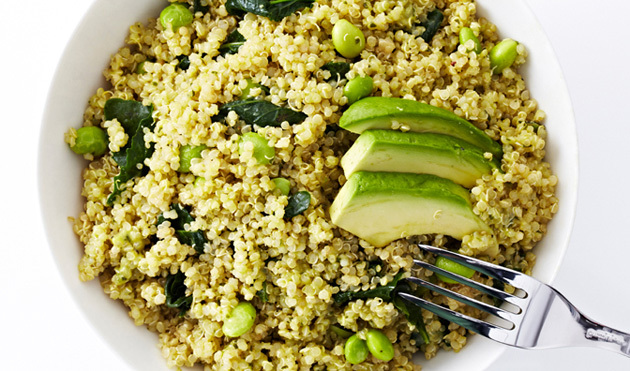 To the cooled quinoa, add chopped avocado and mango, tossing with a few more tablespoons of dressing. 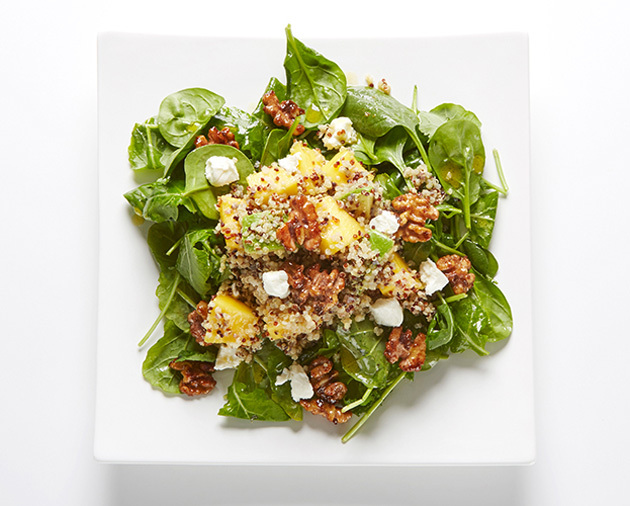 Place quinoa mixture over kale and spinach leaves. Top with crumbled goat cheese and spiced walnuts. Drizzle each serving with extra dressing.